These days, more and more Bay Area homeowners are ditching their old water heaters for cutting-edge tankless models. Because of their advanced technology, tankless water heaters boast an array of practical benefits, not the least of which is a virtually endless supply of hot water. However, going tankless involves more than simply swapping the old for the new, as there are often functionality and compatibility concerns that need to be addressed before and during installation. While sizing a conventional water heater mainly comes down to tank storage capacity, with a tankless unit, it’s a bit more complex. To determine what capacity unit your home will require, you’ll need to gather a couple pieces of information. First, add up the individual flow rates of all the fixtures and appliances in your home that use hot water. Flow rates are expressed as “gallons per minute” (GPM); some fixtures will have their GPM clearly labeled (such as your toilet) while others will need to be manually tested. Next, determine the temperature rise that’s required to bring your home’s incoming water temperature up to the desired level. To do this, simply subtract the former from the latter; for example: 120° F (desired) – 50° F = 70° F temperature rise needed. Once ascertained, your sum flow rate and temperature rise are then correlated to establish the amount of water your tankless unit needs to be able to heat at a certain temperature. Due to the substantial amount of math involved, you may want to consult a plumbing professional who can help you make these calculations. Tankless water heaters use three to four times more BTUs than traditional water heaters. This doesn’t mean a tankless unit uses more gas—it just requires a bigger initial kick to get going since the water isn’t already heated. 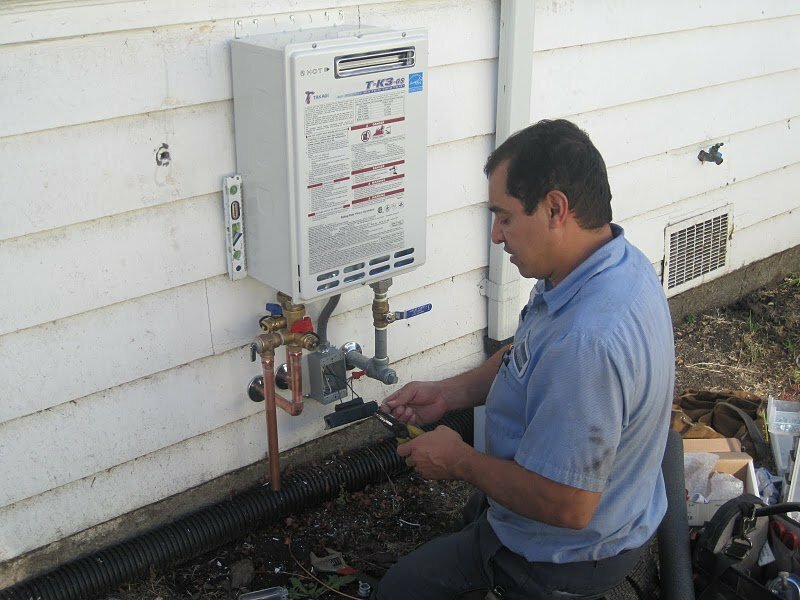 Generally, the minimum gas line size needed to supply a tankless water heater is 3/4-inch. 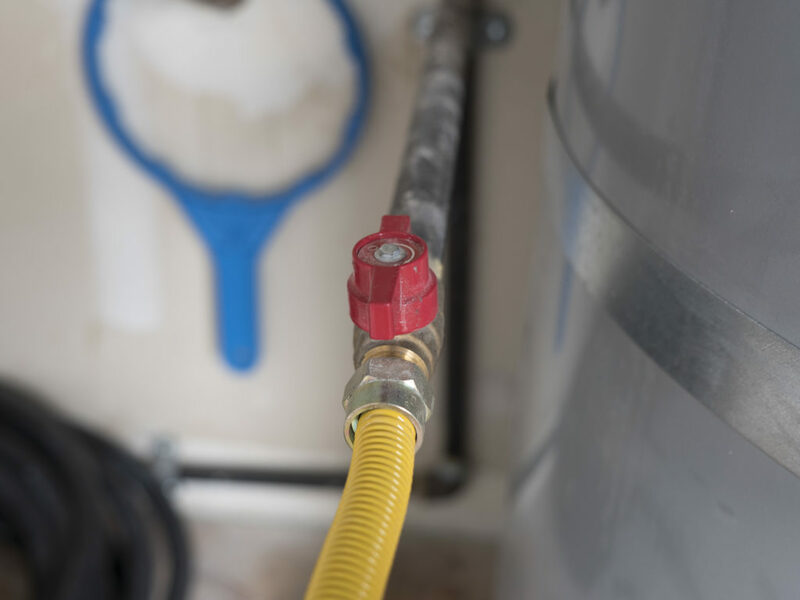 Ask your plumber to verify whether your current gas line is adequate or if you’ll need to modify it to provide sufficient gas flow to your new unit. Tankless water heaters have very different ventilation requirements than their tank predecessors, which is why modifications are often required for installation. A tankless unit can be vented in two ways: power-vent (which relies on indoor air for combustion and vents exhaust to the outside) and direct-vent (which pulls in air from outside of the home and thus requires both an intake and exhaust vent). Regardless of ventilation style, all tankless water heaters require Category III stainless steel venting material, which is corrosion-resistant and gas-tight to prevent carbon monoxide leaks. The only exception to this rule is condensing tankless water heaters, which produce a lower exhaust gas temperature and thus can be vented with a plastic material like PVC or polypropylene. Even if your tankless water heater runs on gas, its PC board and digital remote (the “brains” of the system) require electricity, so you’ll need access to 120-volt electric power. Due to this dependence on electrical power, be aware that your tankless water heater won’t operate if the power goes out. Clearance and ventilation requirements can restrict the placement of a tankless water heater. For instance, since power-vent units rely on indoor air for combustion, they need to be situated in a spacious area or in a room with vents or louvers to ensure adequate air flow. In contrast, since direct-vent units pull air from outside the home, they can be placed in more confined areas like closets or attics. Despite code restrictions, the comparatively small size of tankless units allows for more flexibility when choosing an installation location. They can even be installed on the outside of the home, which, in addition to freeing up space inside the home, greatly simplifies ventilation needs. Since there’s a good chance you’ll need to modify your existing gas line and ventilation to accommodate your new unit, consider relocating it if it’s currently in an inconvenient location. To find a Diamond Certified company in your area that installs and services tankless water heaters, visit www.diamondcertified.org.